Because Giordano Bruno was a Spiritual Christian who taught other Christians the True of the Gospel Teachings which were suppressed by the Church of Rome (see http://OriginalGospel.Ebionite.com ), he was burnt at the stake. Among the countless discussion groups on FaceBook there is one called Thomas Paine Redux https://www.facebook.com/groups/ThomasPaineRedux/ -- which originally contained the below post on Giordano Bruno. And if you look at the very bottom of the post, you will see the words: This post goes against our Community Standards, so no one else can see it. 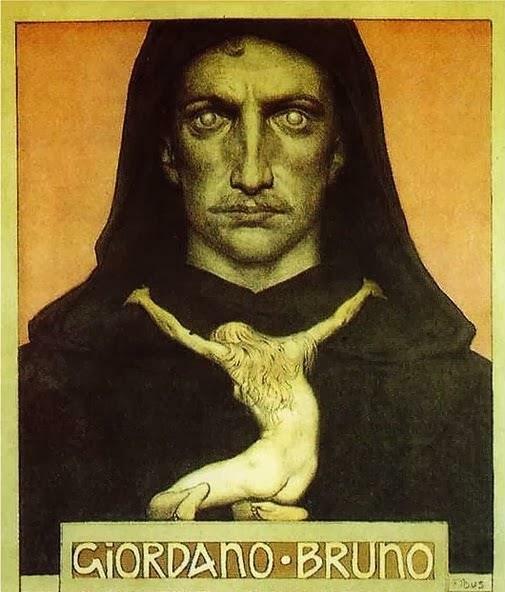 Which means that FaceBook censored this post on Giordano Bruno, so that no one can see it. Yet, I defy anyone to come up with a rational explanation as to why FaceBook censored this post so no one can see it. Why is FaceBook censoring the below post? As demonstrated in the article entitled FaceBook's Raging Atheist Censors Declare War On The Word Of God (see https://brotherofyeshua.blogspot.com/2019/02/facebooks-raging-atheist-censors.html ), FaceBook censorship has been waging war against Spiritual Christianity. Why is FaceBook censoring the below post? Because it makes reference to the website Christian Reincarnation ( http://ChristianReincarnation.org ) -- and the facts presented on this website prove that not only did the Original Gospel contain the teachings on the Soul that evolves to perfection over the course of many UNIQUE lifetimes, but that this teaching is the foundation of the Gospel. All the countless sects and confusion over the Gospel message, is all caused by the removal of this ultra-important teaching. Anyone using any Bible can prove this, in the teaching on "turning about" and becoming a Child to enter the Kingdom (see Turn About And Become As a Child http://KeyOfKnowledge.org#TurnAbout ). Those who walked and talked daily with the historical man Jesus, all witnessed that he was a true holy man who became the Anointed (Messiah/Christ) by fulfilling the Royal Law within his own mind and being (see At-Onement With The Logos/Son Of God http://BrotherOfJesus.org#AtOnement ). And in order to declare the man Jesus God incarnate, by corrupting the very words that God spoke to mankind (see The Corruption Of The Words Of God http://BrotherOfJesus.org#CorruptionOfGodsWords ). Thereby misguiding the vast majority of believers into worshiping their elder brother Jesus, instead of imitating him as the role-model and example in their lives. In censoring the facts from the people, FaceBook is obstructing the knowledge that mankind needs to understand the purpose and objectives of the life that they are presently living, and denying the people access to the Truth of all Truths. What is the purpose and objective of the life that we are all living? What is the true destiny of mankind? How can each of us move beyond natural organic human limits, and arise to our true potential? FaceBook has placed an obstacle to the average person being able to factually answer these questions. Below is a copy of the original post that was put across a private discussion group on Thomas Paine and the founding of the American Constitution, that people had to join, in order to gain access to the post. FaceBook states that the post is against Community Standards -- and it can rationally be asserted that the censorship of this post conveys more about FaceBook and the suppression of Original Spiritual Christianity and free speech, than it does Community Standards. I know a person who in a previous life attended Bruno's lectures on "The Art of Memory" that assisted people to overcome their inherent Spiritual Amnesia (see http://AnInconvenientTruth.org#SpiritualAmnesia ) that inhibited people form developing Soul-Memory -- thereby giving them knowledge of not only the previous lives their Soul has lived, but also the Core of Original Gospel Teachings on spiritual blindness (see Soul-Evolution - Reincarnation And Soul-Development http://OriginalGospel.Ebionite.com#SoulEvolution ). And it is the development of Soul-Memory and overcoming organic human blindness to the higher reality of the Soul, that is despised by both dogmatic Christians and Atheists alike. And this is why the ideologues strive to suppress this important self-knowledge, in order to preserve their ways of keeping mankind ignorant of their own higher Soul-Reality. "The divine perfection of the individual soul is the aim of all progression" -- Matt 5:48: "You, therefore, must be perfect, as your Heavenly Father is perfect". Remembering Giordano Bruno (1548-1600) on the anniversary of his execution. One of the pivotal figures in the history of Western esotericism, the memory of Bruno reminds us that divinity is found in all beings, great and small, and that truth will eventually triumph over any attempts to suppress it. "Filippo Bruno was born in Nola, near Naples, as the son of Giovanni Bruno, ‘uomo d’arme’ (armiger), and Fraulissa Savolino. He first studied in Naples under the direction of Giovan Vincenzo Colle, known as “Il Sarnese”, and the Augustinian father Teofilo da Vairano. In 1565 he entered the Neapolitan monastery of San Domenico Maggiore, taking the name of Giordano. Ordained priest in 1572, he completed his course of theological studies in 1575 with a dissertation on the Summa contra Gentiles. In June 1576 he was accused of having read and studied prohibited books. The seriousness of the accusation induced him to move to Rome, but after learning that the works he had surreptitiously used had been traced in Naples, he decided to quit the Dominican Order. "There then began a period of wandering through Italy: first to Savona, Turin, and Venice (where he published the small, lost work De’ segni de tempi [On the Signs of the Times]), then to Padua and Brescia, where he appears to have cured a demoniac. In 1578 he passed into France, and after a stay at the monastery of Chambéry, moved to Lyon, then to Geneva. He was received by Gian Galeazzo Caracciolo, Marchese of Vico, and entered into contact with the Italian exile community. He worked as a proof-reader, and on March 20 matriculated at the University. In August 1578 Bruno was accused of defaming the Professor of Philosophy, Antoine de la Faye, and was arrested and brought before the Consistory Court. The incident caused him to abandon Geneva and return to France, where he stayed briefly at Lyon before settling in Toulouse. Here he obtained the title of “magister artium” (Master of Arts) and the post of “ordinary reader” in philosophy. The increasing bitterness of religious differences caused him to move to Paris, where he gave a successful course of lectures on the divine attributes. In addition, his courses on the Art of Memory aroused the interest of King Henri III, who, after having invited him to court to ascertain ‘whether the memory he possessed and professed was [obtained] through natural art or through science’, appointed him “extraordinary reader”. In 1583 there appeared the works De umbris idearum (On the Shadows of Ideas), Cantus Circaeus (Circean Song), De compendiosa architectura et complebritten mento artis Lullii (On the Compendious Architecture and the Completion of the Lullian Art), and the comedy Il Candelaio (The Candlestick). "For motives that are not altogether clear, in 1583 he left France for England in the train of Michel de Castelnau, ambassador at the court of Elizabeth I. In the summer he held a course of lectures at Oxford, but on being accused of plagiarism, he was removed from the chair. In the same year appeared works on the subject of memory: Ars reminiscendi (The Art of Remembering), Explicatio triginta sigillorum (Explication of Thirty Seals), and Sigillus sigillorum (The Seal of Seals). Between 1584 and 1585 he composed the cycle of Italian dialogues: La Cena de le Ceneri (The Ash-Wednesday Supper), De la causa, principio et uno (On the Cause, the Beginning, and the One), De l’infinito, universo et mundi (On Infinity, the Universe, and the Worlds), Lo spaccio della bestia trionfante (The Expulsion of the Triumphant Beast), La Cabala del cavallo pegaseo (The Cabala of the Horse Pegasus), and De gl’eroici furori (On the Heroic Furies). "Returning to Paris in October 1585, he undertook a detailed critique of Aristotelian doctrines, first with Figuratio Aristotelici Physici auditus (The Shape of Aristotelian Physics), an original exposition of Aristotle’s physical writings in a mnemotechnical and mythological vein, then with the harsh criticism of Centum et viginti articuli de natura et mundo (120 Articles on Nature and the World), a short work published under the name of his disciple Jean Hennequin, into which was incorporated the material used by Bruno for a public disputation at the College of Cambrai. To this period also belong the polemic with the Salerno geometrician Fabrizio Mordente, evidenced in Dialogi duo de Fabricii Mordentis Salernitani prope divina adinventione ad perfectam cosmimetriae praxim (Two Dialogues on Fabrizio Mordenti the Salternitan on the Divine Invention for the Perfect Practice of World-Measurement) which Bruno issued with the publisher Chevillot. "The worsening of the religious situation prompted him to move to Germany. He passed through Mainz, Wiesbaden, and Marburg, then between 1586 and 1588 stayed in Wittenberg. Matriculated as “doctor italicus” (Italian Doctor), he held private courses on Aristotle, commenting on the physical and rhetorical writings. A cycle of lectures on Rhetorica ad Herennium (Rhetoric to Herennius) was published in 1612 by Heinrich Alsted under the title of Artificium perorandi (The Art of Pleading). In 1587 Bruno published De lampade combinatoria lulliana (On the Lullian Combinatorial Lamp), De progressu et lampade venatoria logicorum(On the Progress and Hunting Lamp of the Logicians), and Animadversiones circa Lampadem Lullianam (Thoughts on the Lullian Lamp), and worked on the first version of Lampas triginta statuarum (Lamp of the 30 Statues) and Libri physicorum Aristotelis explanati (Aristotle’s Books on Physics Explained), which were published posthumously in the edition of the Opera edited by Tocco and Vitelli. In 1588, after publishing a second edition of Centum et viginti articuli, entitled Acrotismus Camoeracensis, he left Wittenberg with the Oratio valedictoria (Farewell Oration). "Next he went to Prague, where he published Articuli centum et sexaginta adversus huius tempestatis mathematicos atque philosophos (160 Articles against the Mathematicians and Philosophers of this Time), dedicated to → Rudolf II, and De lampade combinatoria R. Lullii (On the Combinatorial Lamp of R. Lull). In 1589 he was in Helmstedt at the Academia Iulia: on the occasion of the death of Herzog Julius II von Braunschweig, founder of the Academy, he read an Oratio consolatoria (Consolatory Oration) that was printed in the same year. Beside this, he devoted himself to writing magical treatises: De magia mathematica (On Mathematical Magic), De magia naturali (On Natural Magic), Theses de magia (Theses on Magic), De rerum principiis et elementis et causis (On the Principles, Elements, and Causes of Things), and Medicina lulliana (Lullian Medicine). In 1590 he published at Frankfurt the trilogy of Latin poems, De triplici minimo et mensura (On the Triple Minimum and Measure), De monade numero et figura (On the Monad, Number, and Figure), and De immenso et innumerabilibus (On the Immense and Innumerable Things). Expelled from the city, in 1591 he went to Zurich, where he gave a cycle of lectures collected and published by his pupil Raphael Egli under the title Summa terminorum metaphysicorum (Summa of Metaphysical Terms). In the spring he returned to Frankfurt and published De imaginum signorum et idearum compositione (On the Composition of Images, Signs, and Ideas). "In August 1591 he was invited to Venice by Giovanni Mocenigo, who wished to learn the art of memory. On returning to Italy, Bruno stayed in Padua and Venice, and composed De vinculis in genere (On Bindings in General), Praelectiones geometricae (Geometrical Pre-elections), and Ars deformationum (The Art of Deformations). On May 23, 1592 Mocenigo denounced Bruno to the Venetian Inquisition; the philosopher was arrested and taken to the prison of San Domenico di Castello. On January 9, 1593 his trial began in Rome. In 1599, at the end of a long and complicated legal proceeding, Bruno was invited to abjure eight heretical propositions, singled out by Cardinal Roberto Bellarmino. On December 21, Bruno’s stubborn attitude precipitated the result of the trial: he was handed over to the secular arm and was burned at the stake in the Campo dei Fiori on February 17, 1600. Was Jesus Born Of A Physical Virgin?